Both Pepsi and Coca-Cola in Japan often sell their products in unique “Japan only” flavors (so does Kit-Kat in Japan). and a couple other flavors of Pepsi and Coke in Japan. Well, Pepsi is an official sponsor of the “2010 Soccer World Cup” which will be hosted by South Africa this summer. I’m not a big soccer fan. In fact, the first time I had even heard of the “World Cup” was when Japan co-hosted it with South Korea in 2002. 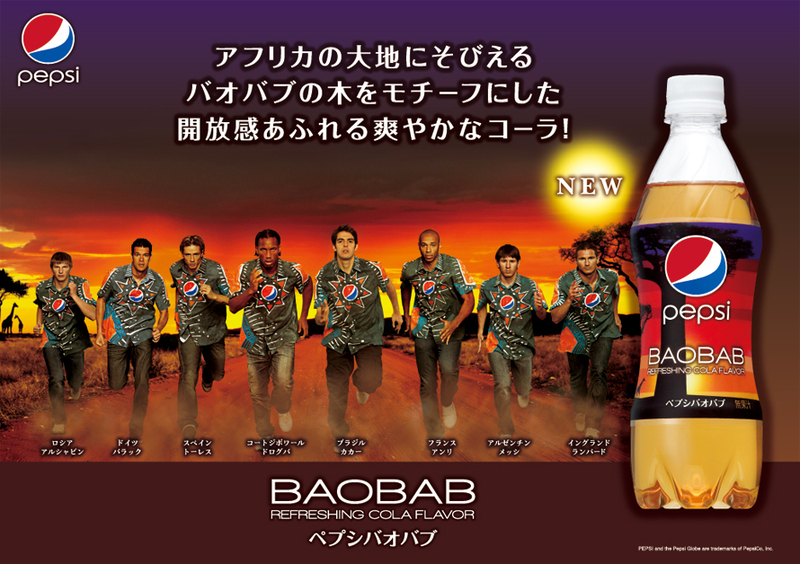 But in honor of the 2010 World Cup, on 2010 May 25, Pepsi will be selling a new product here in Japan called 「ペプシ・バオバブ」 (“Pepsi Baobab“). 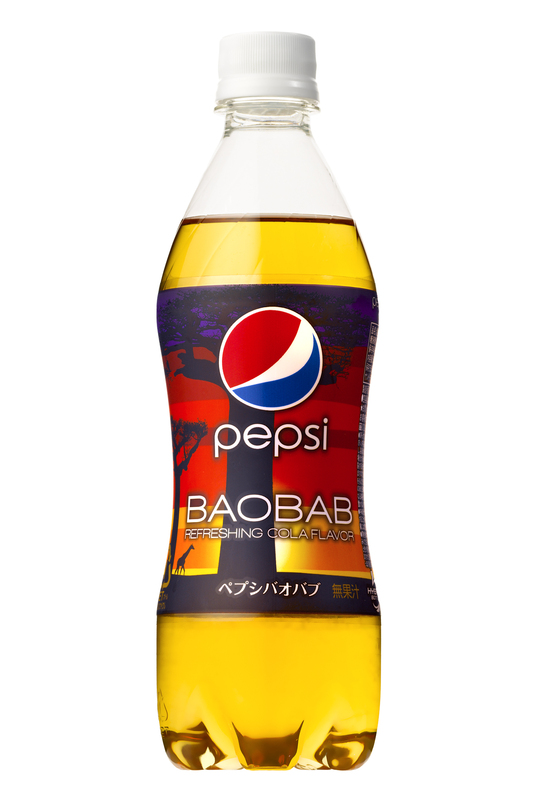 According to Wikipedia, the Baobab is an unusual looking tree (a picture of one is on the “Pepsi Baobab” label) native to Africa. Supposedly, the fruit is extremely healthy. I’ve never heard of it before and I have no idea how the fruit tastes…but maybe I’ll try this new Pepsi flavor once it goes on sale just out of curiosity. The ad for 「ペプシバオバブ」 (“Pepsi Baobab”) has eight soccer players named ロシアのアルシャビン (“Arshavin” of Russia), ドイツのバラック (“Ballack” of Germany), スぺインのトーレス (“Torres” of Spain), コートジポワールのドログバ (“Drogba” of Côte d’Ivoire), ブラジルのカカー (“Kaka” of Brazil), フランスのアンリ (“Henry” of France), アルゼンチンのメッシ (“Mercier” of Argentina) and イングランドのランパード (“Lampard” of England). Also, 「マウンテンデゥー」 (“Mountain Dew“) is owned by Pepsi and in Japan they’re currently selling their drink in cans decorated with characters from the 「メタルギアソリッドピースウォーカー」 (“Metal Gear Solid Peace Walker“) game series. And, I have written posts about the cell-phone straps that often come with purchases of “Pepsi NEX” in Japan. the Samurai straps, the Snoopy straps, and the Star Wars Be@rbricks. the MOS Burger Be@rbricks, and the KISS Be@rbrick). Well, Pepsi NEX has teamed up with Be@rbrick again. 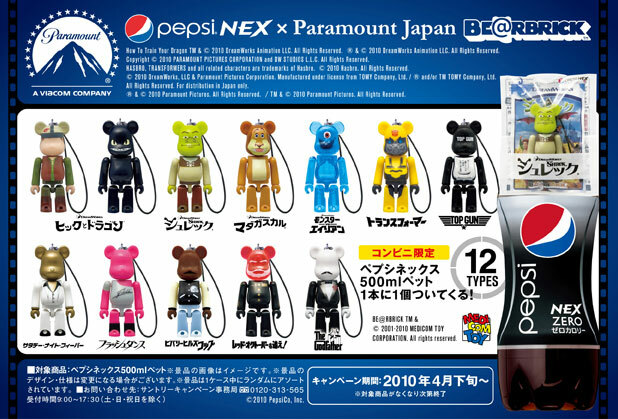 Now, with purchases of Pepsi NEX in Japan, they’re offering bear cell-phone straps in the likeness of famous characters from “Paramount Studios” movies. Such as: 「ヒックとドラゴン」 (“How To Train Your Dragon”), 「シュレック」 (“Shrek”), 「マダガスカル」 (“Magadascar”), 「モンスターVSエイリアン」 (“Monsters vs Aliens”), 「トランスフォーマー」 (“Transformers”), “Top Gun”, 「サタデー・ナイト・フィーバー」 (“Saturday Night Fever”), 「フラッシュダンス」 (“Flashdance”), 「ビバリーヒルズ・コップ」　(“Beverly Hills Cop”), 「レッド・オクトーバーを追え!」 (“The Hunt For Red October”) and “The Godfather”.